How Much Does it Cost To Fly To Grand Rapids? The cheapest flights to Grand Rapids found within the past 7 days were $92. Prices and availability subject to change. Additional terms may apply. Dallas-Fort Worth Intl. - Gerald R. Ford Intl. Grand Rapids is a Michigan city full of surprises. Partake in direct or connecting flights to Grand Rapids, and see for yourself how much anticipation develops; a touch down at Gerald R. Ford International Airport (GRR) takes you one step closer to a vacation sure to delight, whatever your tastes. This city has big city features with the charm and intimacy of a new favorite spot; you could go straight from visiting a local farm to eating their delicious produce at a high-class restaurant in the space of a few hours. Known as the hometown of Gerald Ford, the 38th president of the United States, Grand Rapids is packed with fantastic things to see and do. Grand Rapids flights let you arrive in comfort; why not check into one of the many comfortable and stylish hotels close to Gerald R. Ford International Airport that offer hotel and motel shuttle services? The airport is approximately 25 minutes from bustling downtown Grand Rapids, which means travel from the airport to your accommodation is no trouble at all. If you want to hire a car to explore the delights of Grand Rapids and the surrounding areas, you can access the rental car centers on the first floor of the airport parking garage. Your other transportation options include taxi cabs or the local bus system, known as The Rapid, which is affordable, quick, and reliable. Search Travelocity for amazing Grand Rapid vacation packages that won't break the bank. When you visit Michigan's second-largest city, you'll want to fill your hours with everything from visiting craft breweries to luxuriating on one of the nearby beaches; you'll always benefit from cheap flights to Grand Rapids. Book today with the Travelocity Price Guarantee that will match a lower price, and start planning your "Grand" adventure! Our stay was absolutely superb! We attended the Keith Urbsn concert and love the access of the skywalk. 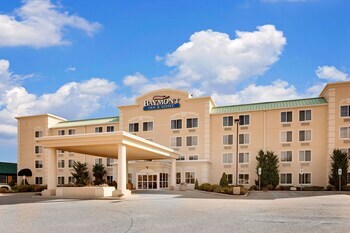 The Amway has great amenities and we will stay there every time we visit Grand Rapids. Not enough parking. Had to park along side of parking lot.